Aromas of newly picked juicy black raspberry dusted with fresh ground black pepper and hints of dark chocolate and oak notes tempt you to sip. The smooth, round entry caresses the palate with layers of balanced flavors—brambly mixed berries mingle with traces of pepper, vanillin oak and cocoa. A bright dark cherry core starts and finishes the wine, and dried strawberry join in as the flavors linger. This food-friendly Zin will pair beautifully with a charcuterie platter, osso buco, spaghetti and meatballs, or molten chocolate cake. If opened before 2016, it is best served decanted. 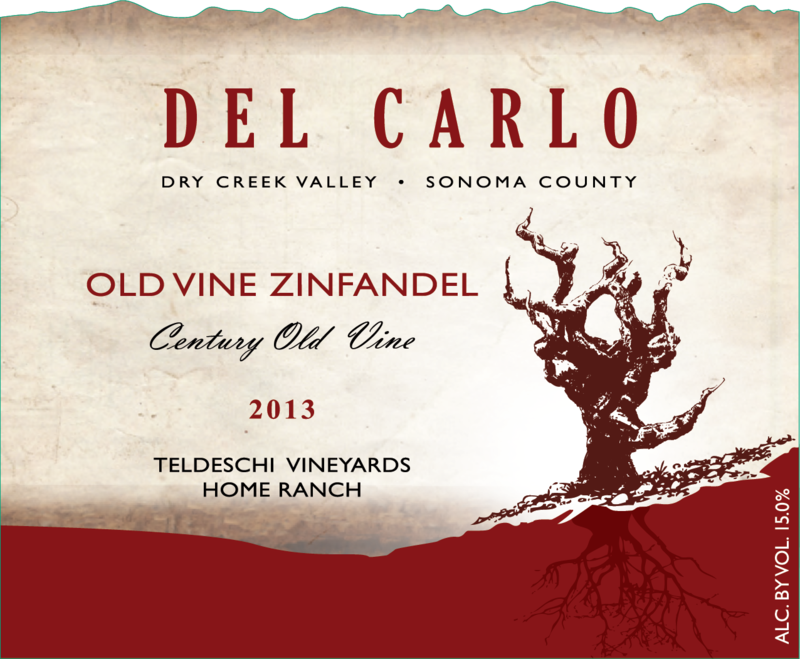 At Del Carlo Winery, when we say “Old Vine Zinfandel” we don’t mean 20, 40 or even 60-year-old vines. 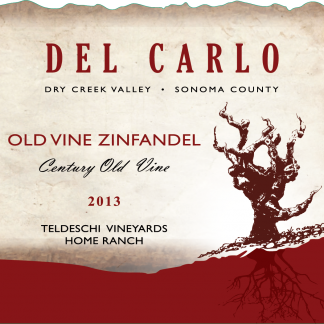 Our Zinfandel comes from vines that are over 100 years old—now those are old vines! Through decades of sustainable farming practices, we’ve maintained the health of our century-plus old vines. Unlike many old vine Zinfandels that tend toward pruney or cloying flavors, our vines produce fruit with the great depth of character found in old vines and the bright fresh flavors of healthy, youthful vines. The proof is in the bottle. Our Old Vine Zinfandel is grown in the heart of the Dry Creek Valley’s eastern benchland. These old vines, hand selected from our family’s oldest block, reflect the superb 2013 growing season. Delicious and full flavored, this wine showcases the elegant and refined dimensions of Zinfandel, and seamlessly pairs with our favorite meals.